Music is something that people of all ages can enjoy. Even small children love music - even if they aren’t sure what it is yet. As kids grow, they might become more interested in music - listening to it, even playing it! But are they ready for music lessons? What is a good age for them to begin music lessons? This article will help answer those questions and help you decide what action to take for your kids. Past studies have shown that early exposure to music helps children cultivate their interest and skill as they grow older, which can often lead to some long-term benefits of learning music. Let’s take a look at what ages you can begin to encourage an interest of music in your child, and what ages are ideal for starting music lessons. Babies fall asleep to lullabies for a reason! When a baby is introduced to music at around 6 months, they might begin to engage with it - moving or dancing. 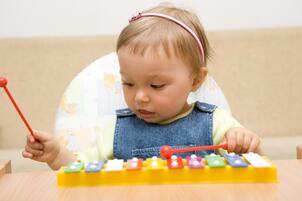 As your child grows, they will be able to familiarize themselves with music even more. Once they are around age 2, they will begin to recognize songs and instruments. A great way to have fun with your child and encourage their curiosity in music is to take a class at Creative Soul. We offer a Makin’ Music Rockin’ Rhythms Program for children ages 0-3. Check out all the details on our website. We’d love to meet your little musician. The ages 4-7 are usually the most ideal for starting to learn an instrument. Not only are kids’ hands and minds functional enough to play, but they can actually begin to understand the basics of music. A great way for kids to start learning more about music is to sign them up for a weekly class at Creative Soul called Little Soul Rockers. Children will be able to interact with each other, learning an instrument and the basics of music theory in the process. This also gives parents a little bit of a break in their busy week. If your child decides that music is something they want to adopt as a hobby, you can also sign them up for private lessons to learn a variety of instruments! And the best part is that they aren’t required to have any prior musical experience or knowledge. Our instructors are here to befriend, encourage and teach your child wherever their skillset lies. Ideal Instruments: Drums, Guitar, Harmonica, Piano, Ukulele, Voice, etc. If your child started learning an instrument at an early age, by age 10 kids can have a moderate to advanced set of skills that they can further work toward developing. Private lessons at Creative Soul are offered to ages 4 all the way to adulthood. If you, as a parent, would love to pick up a new skill - or maybe you used to play - we’d love to teach you, too! You can choose to learn an instrument with your child or not. It’s never too late! 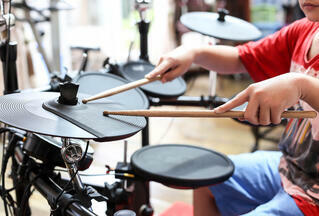 Even if music-making isn’t your interest, you can always stay supportive as your child begins music lessons. Talk to them about what they are learning. Ask them to show you! Ideal Instruments: Banjo, Bass, Drums, Dulcimer, Guitar, Harmonica, Piano, Saxophone, Trumpet, Ukulele, Violin, Voice, etc. Don’t forget to check out music lessons at Creative Soul! What instrument is your child interested in? Is there an instrument you’ve always wanted to learn? Tell us in the comments!